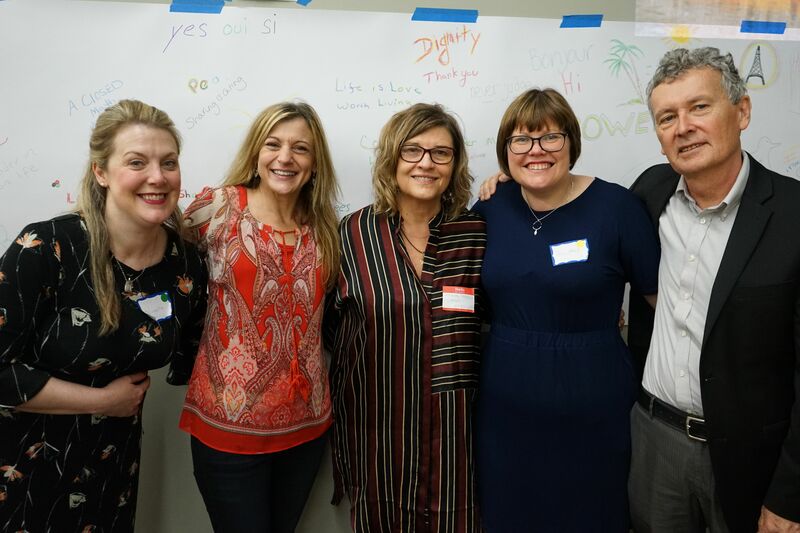 Research collaborators at the 2018 International Recovery and Citizenship Conference (L to R): Dr. N. Cogan, Dr. M. O’Connell, Dr. R. Campos, Dr. G. Macintyre, and Dr. M. Rowe. There are many current/ongoing research projects in the CCC, many of which are summarized here. To view previously completed research projects, please see the link for published studies (hyperlink). In the CCC, we value participatory research in which stakeholders are essential and integral to all stages of research. We also value research broadly defined – in all of our projects, we are continually learning and watching and evaluating the project and its impact in multiple ways including qualitative, quantitative, and observational data. The experience and personal effects of FACE group participation – Qualitative interviews were conducted with FACE members and leadership examining the experience of being in the FACE group and how it has affected one’s larger relationship to the community and citizenship. 12 interviews have been conducted and are being analyzed using a participatory process and phenomenological analysis. The impact of the Citizens Project – The Citizens Project has been ongoing for 18 years. Evaluation of this project has continued alongside the intervention including a previously published study of outcomes (list some of them here and also reference publication page). Current research involves looking at the impact of participating in the project on graduates’ citizenship. Future research intends to examine the effect of citizenship on further outcomes including quality of life, recovery, social determinants of health (housing, employment, healthcare access, social capital), behavioral and physical health, future criminal involvement, and re-incarceration. Evaluating the “Recovering Citizenship” learning collaborative – Agencies funded by CT DMHAS have been participating monthly for 18 months in a “learning collaborative” where agency staff learn about conducting citizenship-oriented care at their agencies and share successes and struggles with other learning collaborative members. Topics have included improving financial health of clients, social determinants of health, structural competency, partnering with the community, and improving clients’ voter rights. An evaluation of the feasibility, acceptability, and tolerability of this learning collaborative is ongoing throughout the training. The impact of Musical Intervention – A mixed method (qualitative, quantitative) evaluation of the community intervention Musical Intervention (hyperlink) that aims to encourage and record musicianship in the greater New Haven community has been completed and is being written up for publication. The evaluation examined how Musical Intervention works as well as the experience of its participants and how it has affected their lives. Transformative education, citizenship and activism in Scotland and the USA – Through an international partnership with Strathclyde University, Scotland which is funded by the European “Citizenship, Recovery and Inclusive Societies Partnership” (CRISP) project, we are conducting a qualitative study exploring the links between education, agency and community organising/activism in Scotland and the USA. This project will include interviews with graduates of Citizens Project who have moved on to the FACE group and/or other forms of community organizing in New Haven and also graduates of a course developed in Scotland called “Mad People’s History and Identity.” It aims to add to our understanding of informal or transformative education, citizenship and activism for people with experience of mental health issues. Financial health research: Debt and mental health – A project entitled “Criminal Justice related Debt and Mental Health: Barriers to Re-entry and Recovery,” funded by the Fahs-Beck Fund for Research and Experimentation, beginning in September 2018, will explore the impact of debt, including criminal-justice debt, on the recovery and re-entry of people with serious mental illness coming out of incarceration, and on their social networks. Recognizing that there are many types of debt that impact people with mental illness, the Financial Health project is beginning to research the issue in more detail, including exploring what data is available about the types of debt that affects low-income and otherwise vulnerable populations. Future research on this topic is planned, including about the impact of utility arrears and disconnections on people with mental illness, and the impact of debt specifically on people with lived experience of mental illness working in the field of peer support. Financial health research: Inclusive municipal financial empowerment – The Financial Health team plays a lead role in the New Haven Financial Empowerment project, working to ensure that financial empowerment services, including one-on-one counseling and safe, affordable banking services, are available at the municipal level, and that they are fully inclusive of people with mental illness. Students at the Yale School of Management work with the Financial Health project on an annual basis to advise the New Haven Financial Empowerment project, through conducting research into specific issues. A research project in collaboration with the Yale Divinity School and Trinity Church on the Green is planned to better understand the financial situations of vulnerable populations who attend services at the church. The data will be used by the church to inform design of financial support services for that population. The Financial Health project also works closely with the Yale Law School’s Community and Economic Development Clinic, focusing on inclusive and fair banking for people with mental illness. Research projects have included innovative savings products for vulnerable populations, view-only accounts for people who need guidance but not loss of financial control, and creation of power-of-attorney templates for supported decision making around finances. Financial health research: Benefits and mental health – The Financial Health project is considering the implications of a Universal Basic Income on people with mental illness.